Looking For The Best Throat Spray For Singers? Here’s a look at our favorites, including our top pick the – Singer’s Saving Grace Professional Strength – Alcohol Free. 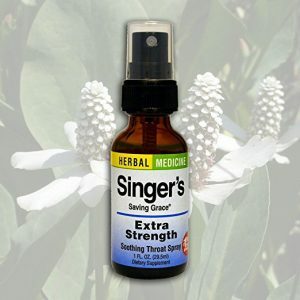 If you’re a singer, you’re going to have a lifetime battle with dry, sore throats. Believe me, I understand the frustration! 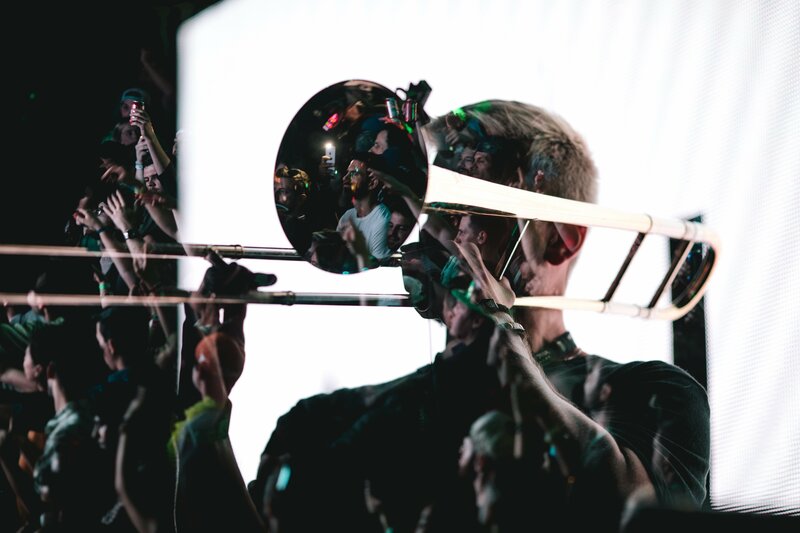 Nothing is worse than facing a crowd of smiling faces who are eager to hear you perform, and all you can give them in return is a hoarse voice (or worse—no voice at all). That’s especially problematic if you’re part of a band that relies on your voice, as your sore throat affects their ability to perform, too. That’s why we put together our list of the best throat spray for singers. Fortunately, a good regimen of natural throat products before, during, and after performances can prevent that from happening. 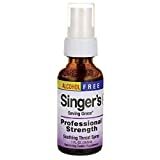 Singer’s Saving Grace Professional Strength throat spray has been delivering comfort to singers with sore throats for more than 24 years. It works quickly to loosen, thin, and clear mucus buildup, ultimately protecting and fortifying throat tissues to increase resistance and resilience. It is also proven to improve throat circulation. Here’s a few features to consider about this best throat spray for singers. 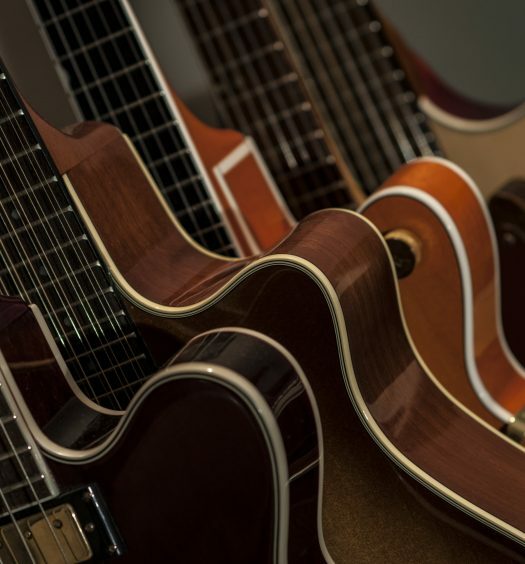 Singer’s Saving Grace also comes in an extra-strength version if you need a little extra kick. It’s an herbal medicine, so it’s ideal for sore throats (rather than a throat that’s just dry or irritated). This spray has a small amount of alcohol to numb and soothe your throat, and it includes Propolis (aka bee glue), a natural product of honey bees that’s used to heal wounds and fight bacteria. The herbal medicine also promotes vocal comfort and clarity by moistening and lubricating your throat tissues. Here’s a few features to consider about this best throat spray for singers. Entertainer’s Secret Throat Relief Spray is designed to replicate natural mucosal secretions and naturally lubricate, humidify, and moisturize the mucus membranes in your larynx and throat. As such, it’s especially useful for dealing with excessively dry throats and hoarse voices. 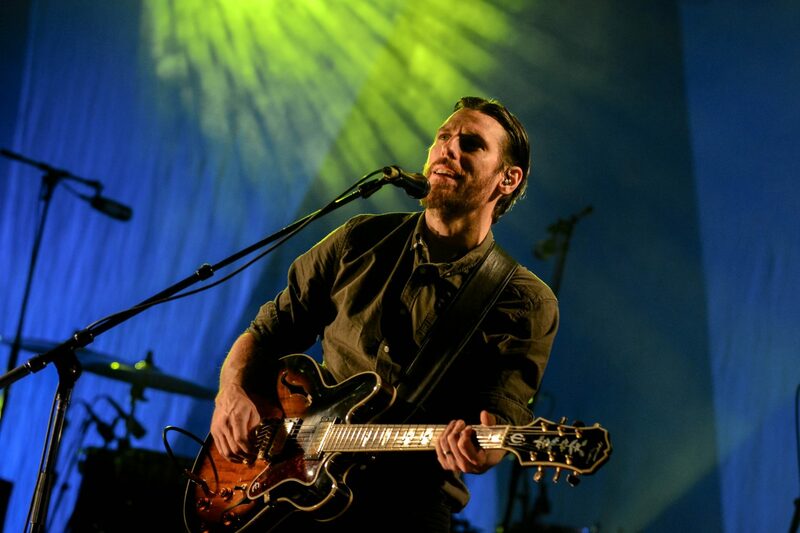 Entertainer’s Secret is proven to restore vocal quality, quickly, safely and effectively. You’ll know it’s working when you feel a cool, comforting tingle the moment you spray it. Here’s a few features to consider about this best throat spray for singers. 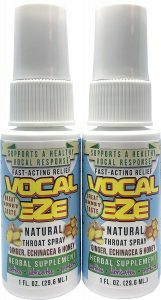 Vocal Eze was developed specifically for singers with the help of artists from Sony Music Nashville and the CMA Awards. In fact, Vocal Eze is officially endorsed by Tim McGraw, Joss Stone, and Rob Thomas. The all-natural spray is ideal for sore throats and excessive dryness and is proven to soothe and lubricate your throat. It’s great for overused, strained vocal cords, and it can also be used to prevent damage to your throat the moment you start to feel that familiar tightness in your throat. Here’s a few features to consider about this best throat spray for singers. This herbal spray by Banyan Botanicals appeals to the Ayurveda tradition of treating an excess of kapha in the body. Without diving into a full discussion of Ayurveda and the three doshas, all you need to understand is that mucus buildup and a sore throat are signs of an excess level of kapha in the body. Throat Soother therefore seeks to heal your throat and clear the mucus by eliminating the excess kapha from your throat and airways. Whether you believe in the Ayurveda tradition or not, this herbal spray does a great job of rejuvenating the throat and promoting vocal clarity. Here’s a few features to consider about this best throat spray for singers. Keep in mind that the sensitive tissues of the throat tend to offer the first sign that the immune system is under stress or is compromised, so you need to learn to feel the difference between a dry, uncomfortable throat versus a sick, sore throat. If you’re sick, using herbal sprays may not effectively treat the underlying problem. In such cases, you should consult with your physician to see if any medication is necessary.